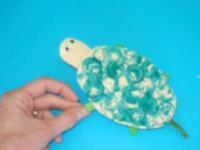 An adorable turtle that will provide peek-a-boo fun for little ones. 1. Gather your material. 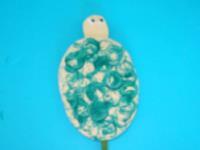 You will need beige cardboard, green poster paint, scissors, a cork, two (2) small aluminum pie plates, white and/or hot glue, wiggly eyes, three (3) green Popsicle sticks, and a green shoelace. 2. 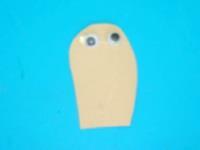 Cut an oval shape out of the beige cardboard to represent the turtle's shell. 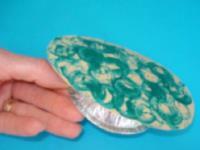 Pour a small quantity of green poster paint in one of the pie plates. Press the cork in the paint and then on the shell to add scales. Let dry. 3. 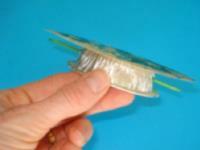 Glue the shell on the bottom of the second pie plate. 4. Use the scissors to cut two small slits in the pie plate, just large enough to slide a Popsicle stick through. 5. Cut the turtle's head out of the remaining cardboard. 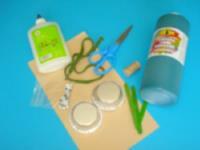 Glue two wiggly eyes at the top of the head. 6. 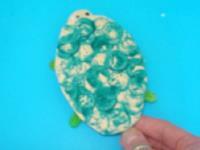 Glue the turtle's head on one end of the Popsicle stick inserted in the slit. Cut a small piece of the green shoelace and attach it to the other end of the Popsicle stick to represent the turtle's tail. 7. 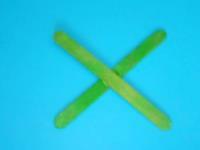 Glue the two remaining Popsicle sticks together to form an « X ». 8. 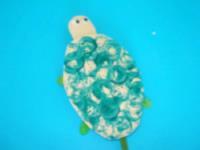 Glue the « X » under the turtle so that the tips of the sticks can be seen on either side of the turtle (the turtle's legs). 9. Children will enjoy pulling on the Popsicle stick to hide the turtle's head in its shell. 10. They will have just as much fun sliding the stick to make the turtle's head reappear.